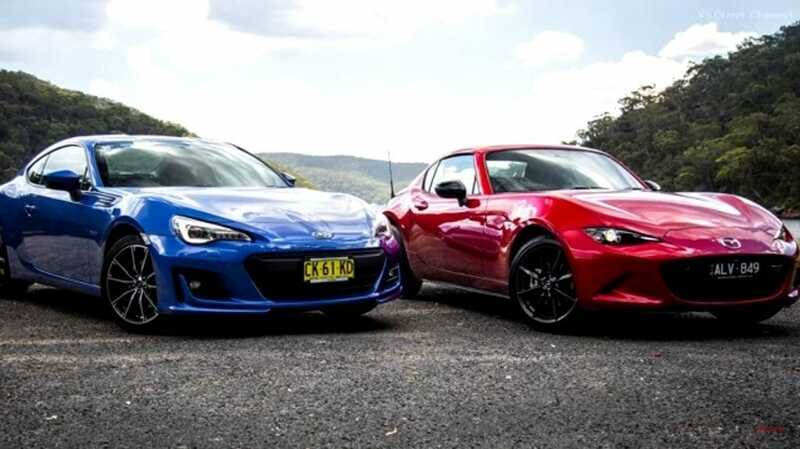 If you’re looking for a sports car to go fast, the stop by Island Mazda in Staten Island, NY to compare the 2017 MX-5 Miata Vs. 2017 Subaru BRZ. There’s more than one road to driving thrills. The MX-5 takes the route of a lightweight, rear-wheel-drive roadster. And when a driver is behind the wheel, near-perfect 50/50 balance. Wherever possible, the MX-5 Miata underwent painstaking weight loss. Even the window glass is lighter. The MX-5 is nearly a half-inch lower in height and has undergone a weight loss of more than 148 pounds from previous generation, bringing its curb weight down to 2,332 pounds for manual transmission models. You may not see it, but you’ll feel it, as SKYACTIV TECHNOLOGY contributes to the MX-5’s lightness and responsiveness. In and out of every corner. The MX-5’s six-speed manual transmission is smaller and lighter than its predecessor, without sacrificing its famed short-throw precision. Highly rigid yet incredibly light, the SKYACTIV Chassis resists torsion during aggressive cornering and plays a key role in the MX-5’s celebrated nimbleness and stability. By pushing Mazda’s cars to the extreme in fast-paced and unforgiving environments, we learn valuable lessons about safety, performance, efficiency, and reliability. And that translates into a better car for you, both on the road and on the track. After all, more Mazdas are road-raced on any given weekend than any other car. An extremely low and rearward engine placement means you get a sports car with optimal balance, an extremely low center of gravity, lightning reflexes, and exceptional rear-wheel-drive handling dynamics. A re-calibrated vehicle stability control system features a ‘Track’ mode for even more handling control when you need it. The BRZ is designed to perform like a sports car should, with independent MacPherson struts in the front and independent double wishbone suspension in the back. And its Torsen® limited-slip differential provides improved grip, making it lively and dynamic through the corners. The BRZ features a standard 6-speed fully synchronized close-ratio manual transmission for pinpoint command. A naturally aspirated 2.0 liter horizontally opposed SUBARU BOXER® engine is retuned to provide up to 205-hp, combining balance with power and efficiency. Direct- and port-injection technology provides more than 100 hp per liter without the need for turbocharging, while the Dual Active Valve Control System optimizes valve timing for a maximum response all the way to the 7,400 RPM redline. Don’t miss out on the chance to test drive and review the 2017 Mazda MX-5 Miata Vs. 2017 Subaru BRZ at Island Mazda near Staten Island, NY.